"Marchington Woodlands Church was built at the instigation and largely at the expense of Thomas Webb of Smallwood Manor. 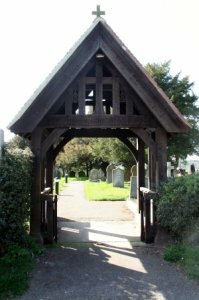 It was built to serve a scattered parish, most of the inhabitants of which, until the erection of the new Church, were compelled to walk two and a half miles either to Marchington or to Newborough in order to attend divine service. This had long been felt to be a great evil, entailing much inconvenience upon devout worshippers, and fostering a feeling of indifference in the minds of many too ready to plead as an excuse for not attending church that there was, in fact, no church for them to attend. "The premature death of Thomas Webb's wife Lucinda, in 1858, strengthened his resolve to fill this need. A London architect, A.D. Gough, was engaged and two and a half thousand pounds was raised from the local land owners, gentry and public at large. Webb donated the land and £1050 and his immediate family gave considerable donations. A list of people making donations can be seen on the board at the back of the Church. 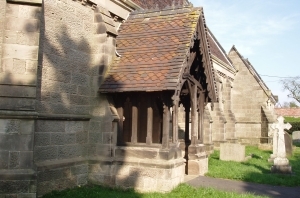 "Mr. Evans of Ellastone was contracted to build the new church of Hollington stone. The foundation stone was laid by the Vicar of Hanbury, the Reverend James Riddell, on October 26th, 1858 and the finished building was consecrated by the Bishop of Lichfield on September 6th, 1859. It is quoted that the large sum of £137 9s. 1d was collected at the consecration service and an elegant lunch was served at Smallwood Manor for all who attended. "The new incumbent was to be the former rector of Cleobury North, Shropshire who had made a handsome contribution towards the cost of the new church. He was the Reverend J.B. Webb, the brother of the new patron. He remained curate for only two years and four other incumbents followed him in quick succession. Stability was achieved with the appointment in 1870 of Alfred Boddington, who remained curate for the next thirty two years. But he began badly, as this rather tetchy entry in Thomas Webb's diary shows "Afternoon service, Our new clergyman preached an extemporary sermon, very badly delivered and not eloquent, We should much prefer that he would write his sermons." "It was originally planned to build, north of the church, a parsonage and a school. The parsonage was never built, a persistent local belief being that Thomas Webb determined never to have a resident parson in the parish under a separate roof, but the school was to follow some ten years later on a site below the new church, largely through the efforts of Webb and the Bagot family. "The close link between Marchington Woodlands Church and Smallwood continued more or less unbroken through the change of ownership in the 1880's. The rebuilding of the new Smallwood Manor and its conversion to a school in the 1920's. For fifty years Smallwood boys made the journey toWoodlands church across the fields in every sort of weather. Late arrivals for 11 o'clock matins most winter mornings would have to pick their way through a porchful of steaming Wellingtons. The school, during these years provided organist, choir and the majority of the congregation at morning service and the parents gave generously when necessary repairs and improvements were made to the fabric of the building. The link effectively came to an end in 1979 when Smallwood opened its own chapel, a development regretted by many in the Woodlands. 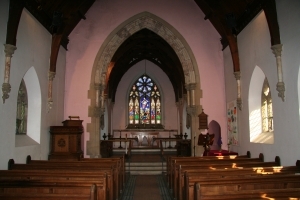 Congregations have fluctuated since this time, especially since the closure of the Village school in 1981, whilst, as the building ages, it requires continued maintenance to keep this wonderful and beautiful building in good heart for the future. I hope that we can keep it so."